“Employment of substance abuse and behavioral disorder counselors is projected to grow 31 percent from 2012 to 2022, much faster than the average for all occupations.” Bureau of Labor Statistics, U.S. Department of Labor, Occupational Outlook Handbook, 2014-15 Edition. Breining has developed an online, six-part CATC Exam Tutorial to help you prepare for the CATC Exam. The tutorial is free. 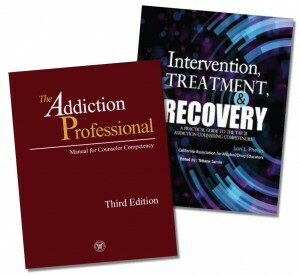 The recommended textbooks, which the tutorial walks you through, are The Addiction Professional: Manual for Counselor Competency, 3rd Edition (2014), Breining Institute; and Intervention, Treatment and Recovery: A Practical Guide to the TAP 21 Addiction Counseling Competencies (2013), Lori L. Phelps, Psy.D., CATC V, Executive Director, CAADE.